Black Friday seems to have quite a few deals in electronics and such, but our friend flatware always gets ignored. 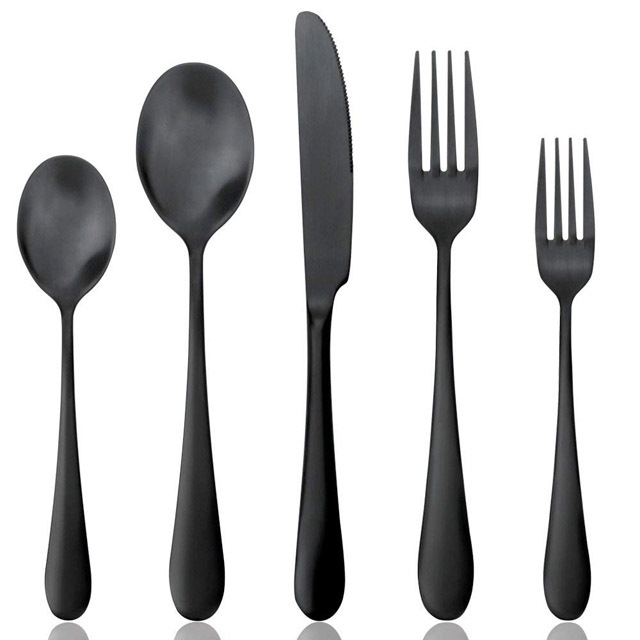 This black cutlery set from AOOSY is sort of Black Friday deal. The AOOSY 20-piece Modern Matte Titanium Black Plated set is made of dishwasher safe (w/non lemon or citrus scented detergent) 18/10 stainless steel. It is electroplated with titanium black , rust proof, high hardness, Lead-free, Cadmium-free, Phthalate-free, BPA-free durable and eco-friendly! Dinner knife: can be used to cut any kind of cooked meat, pizza, cake, or bread. Dinner fork : can be used to eat all kinds of pasta, noodles, or fruits. Dinner spoon: can be used to eat rice, soup or stews. Dessert Fork: can be used to eat all kinds of fruits, cake, tarts or pies. Dessert spoon: can be used for stirring hot drinks, or eating ice cream, tarts, custards or tiramisu.